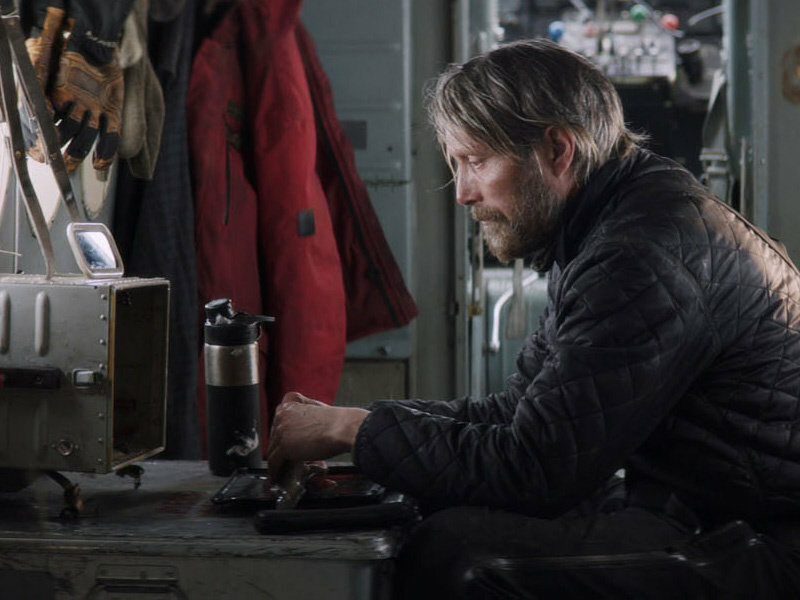 Joe Penna's debut, survival film Arctic, is yet another showcase for the formidable Mads Mikkelsen, who continues to carve out a space in modern moviemaking that few other actors could occupy. If there's an actor working today who's able to command the immediate emotional presence of silent cinema, it's probably the striking Dane, Mads Mikkelsen. With his beautiful facial bone structure and the rigid composure of a dancer or gymnast (he was, in fact, both before his acting career took off), Mikkelsen has made an impressively versatile and long-lasting career out of saying very little. Although American audiences likely know him mostly from the grim and gorgeous NBC TV series, Hannibal, his turns in Danish films like Nicolas Winding Refn's Pusher (1996) and Valhalla Rising (ibid, 2000, enjoy Brice Ezell's interview with Winding, here), were the first to give international audiences a taste of his uniquely severe emotionality. It's fitting, then, that Mikkelsen would star in a film like Joe Penna's Arctic. Within the ever-increasing survivalist film genre, leading actors typically must be able to pull off both a brutish physicality and a stoic personality that nevertheless betrays some sort of convincing internal turmoil. In Valhalla Rising, as the imprisoned thrall One-Eye, Mikkelsen pulled this off without uttering a single word. 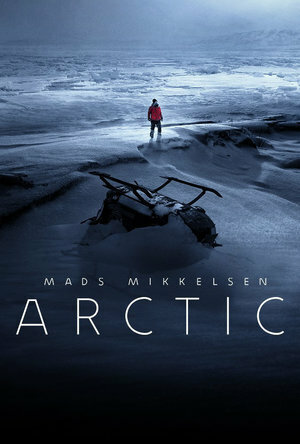 Arctic demands slightly more verbosity, and yet it's the actor's inimitable talent for silent acting that carries the narrative into deeper, more emotionally resonant territory. The film is Penna's directorial debut, but the Brazilian has been working with video for more than a decade. In Brazil, he's known for the YouTube channel, MysteryGuitarMan, which currently has more than 2.7 million subscribers. A separate channel, where Penna uploads behind-the-scenes and making-of compilations, has over 300,000. His experience shows in Arctic, which was shot on location in Iceland over a period of 19 days. In an interview with the Los Angeles Times (Kenneth Turan, 11 May 2018), Mikkelsen called it the most difficult shoot of his career. The narrative in Arctic is straightforward. Mikkelsen plays a man named Overgard, who spends his days surviving in the arctic by sticking to a series of rituals and relying on various contraptions for food, shelter and transportation. We only see glimpses of this kind of life's brutalities at first; Overgard is purple in the feet and missing a few toes, but the relative safety of his camp mostly shields him from immediate danger. One day, a helicopter flies near the camp, and he flags it down by setting off a flare. The helicopter attempts to land, but in doing so it gets caught up in the wind and crashes, killing its pilot. A passenger, a severely injured young woman (María Thelma Smáradóttir), is left in the rubble, and Overgard rushes to save her, taking responsibility for her life in addition to his own. He never once questions the ethical or moral reasons behind this decision, instead operating on the fumes of a passionate practicality. With an injured second body under his watch, Overgard realizes that it's time to leave the safety of his camp for help. Penna and cinematographer Tómas Örn Tómasson shoot these scenes in typical realist fashion, making room for both wide shots of the arctic expanse and for close-ups of Mikkelsen's weather-beaten face. There's natural beauty to the chaos, but there's no effort made to glamorize the wilderness. If Arctic is in any way romantic, it is so only about the nature of the human spirit. It's almost as if, when the young woman joins his camp, Overgard is given a reason to attempt true salvation. It plays out much like parenthood, with the instinctual, frenzied desire to care for the vulnerable overriding more selfish needs. Overgard's actions, then, and his potent, unwavering brand of solidarity, carry the weight of the film's script, which is spare. But this sort of minimalism, while satisfying on a certain level, is a hindrance in terms of establishing any sort of larger meaning around basic plot points. The circumstances that led to this estrangement are unclear. There are no flashbacks, only photos — Overgard's ID, and the woman's photo of her husband (who we can assume is the man killed in the helicopter crash) and baby. Overgard places this photo always within the woman's eyesight so as to provide some sort of motivation, and yet its resonance is thin, unable to be fully felt by audiences kept blind to any sort of backstory. It's an effective tactic in some respects, highlighting the bleak anonymity of being trapped in the middle of a harsh landscape, and yet in this case it mostly serves as a roadblock to a more relatable story that might have been easier to invest in. Instead, Arctic's biggest strengths are in its arguments as a moral fable. While we're left questioning just who these characters are, there's very little inner turmoil to Overgard's new journey. If anything, his indomitable spirit arises out of his newfound responsibility for the woman, who gives him a reason to put up a good fight. This is an objectively optimistic view of humanity, and one which many other directors would likely be too cynical to take. There's something admirable about this, and it poses an interesting question moving forward in Penna's career: Are these grand moral quandaries of specific interest to the director, or are they just circumstantial to his work here? Throughout the film there's also the obvious question of how it will end. If Overgard and the woman are saved, Arctic's statement is overall a rather positive one. If they die, the takeaway is murkier but no less interesting. Arctic isn't a groundbreaking tale of survival, and at times it's far too safe to break out in a world of daring, breathtaking cinema, but it's a well-executed film that establishes Penna's evolution from YouTuber to film artist. It's also yet another showcase for the formidable Mikkelsen, who continues to carve out a space in modern moviemaking that few other actors could occupy. The film won't win any awards, but it's rewarding in the same manner as a well-composed photograph. It's satisfying enough in its simplicity.